Versatex Screen Printing Inks are specifically designed for silk screening, stencilling, and block printing. The colors are inter-mixable and can be thinned with water. Though heavily pigmented, Versatex will not change the texture or softness of your fabric and it will not wrinkle or bleed on paper. Versatex has a thick and creamy consistency and is ready to use. It is used by professional printers because of its strength of color and its permanency. For more info and to see how these inks stack up against the competition, see our Screen Printing Inks Comparison Chart. COLD WEATHER SHIPPING ADVICE: This product does not do well when frozen if shipped a slow method across country during the winter. Consider shipping it on Monday and shipping it faster than ground, especially if you know it will have to go through some bad weather to get to you. 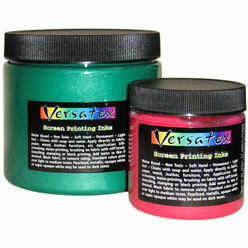 Versatex Screen Printing Inks are specifically designed for silk screening, stenciling, and block printing. The colors are intermixable and can be thinned with water. Though heavily pigmented, Versatex will not change the texture or softness of your fabric and it will not wrinkle or bleed on paper. Versatex has a thick and creamy consistency and is ready to use. 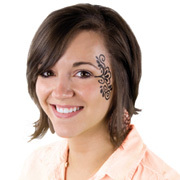 It is used by professional printers because of its strength of color and its permanency. Its ease of application makes Versatex Printing Ink a desirable medium for all those interested in creating art on textiles. 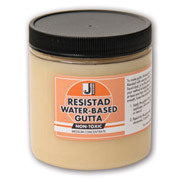 Also great for doing hand (or feet) printing (since it is totally non-toxic), and free hand painting. Versatex is the softest of our screen printing inks. Versatex colors are intermixable, water soluble, non-toxic, somewhat transparent, and work best on light fabric. These semi-transparent inks are most luminous on light colored fabrics. Beautiful transparent overlays can be achieved with the use of the Clear Extender. Mix colors with white for opaque pastels. Overlapping pastels yields new shades. Vesatex will effectively print over light tones but will not hide dark tones unless you are using the metallics or mixing with opaque white. Colors are deepest when applied at packaged strength and become permanent when heat set properly. Versatex is made permanent to washing by heatsetting with an iron on the hottest cotton setting at least 20-30 seconds per square foot. It can also be set in a conveyor type oven at 350º for 3 minutes. Even easier (and softer! 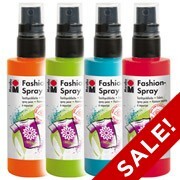 ), mix with the No Heat Fixative below right before using for permanent results! When used this way, you almost can't feel that it is there! A word on the "fluorescents" :While these colors are incredibly brilliant they will only weakly fluoresce under black light. 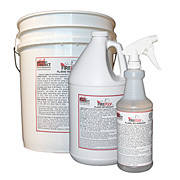 Versatex "No Heat" Fixative makes your paints lightfast and washfast without heat setting. Versatex Printing Ink Extender is used to create pastels and transluscent overlays. 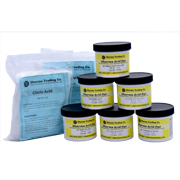 Versatex Printing Ink Starter Sets Great way to get started with Versatex Printing Ink. Versatex may be used on all types of fabric. The colors are semi transparent so they work best on light colored fabrics. Versatex Printing extender VPI #300 may be added for obtaining pastels and transparent overlays. 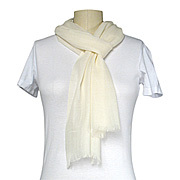 Mix colors with white for opaque pastels. Overlapping transparent colors produce new shades. The primaries combine well to make a variety of colors. Colors are their deepest when applied at packaged strength. For permanency and wash fastness on fabric the printing inks must be heat set (see instructions below). Use cotton rag papers suitable for serigraphy. Versatex Printing Inks work best on white or light tones of paper due to the transparency of the inks. The consistency of the inks is suitable for direct application. They will not wrinkle or bleed on paper. 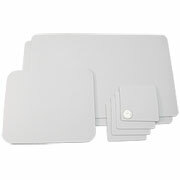 They are strongest when applied at packaged strength, and may be thinned with extender for overlays and pastel tones. Use decorator blocks, stiff brushes, or short napped roller for painting on fabric. 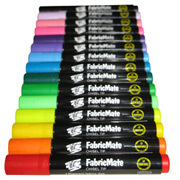 Be sure to work color into fabric, avoiding excessive build up of color. Natural bristle brushes are preferable, as used for oil or watercolor painting. Stencils are useful for repeat designs and masking tape is an easy way to make stripes and crisp edges. Painting with a sponge can produce interesting half tone effects. Versatex will print effectively over light to medium tones, but will not hide dark tones. Versatex colors are press ready, metallic textile inks. These inks are utilized to achieve a shimmering affect when exposed to sunlight and reflect when in direct light in night. These inks possess excellent colorfastness. Even though they are made with higer solids content, they will produce a softer hand than many other types of ink. 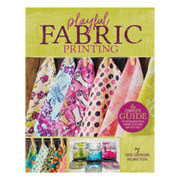 These inks can be printed on both light and dark fabrics. Inks contain glitter and should be mixed well before using. 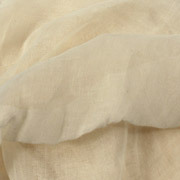 Substrates: cottons, contt/polyester blends, terry cloth, canvas, and natural fibers, nylons. 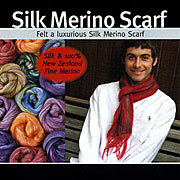 End Uses: t-shirts, colored t-shirts, high fashion garments, towels and sweatshirts, nylons. Screen Mesh: excellent run abilitiy with meshes 60 to 86 monofilament polyesters. Mix or blend your own colors by using a medium speed mechanical mixer. All colors may be intermixed but test for color accuracy before applying. Be sure to leave screen flooded while printing or during delays in the printing process. 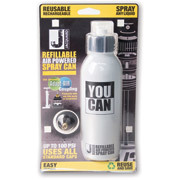 In low humidity or when it is hot use a spray bottle with water to keep ink moist. For best results allow painted or printed fabric to dry thoroughly, approximately one half hour, or for faster drying, place under a lamp, then heat-set. Heat setting locks color into fibers allowing for normal laundering. Setting with an Iron: When using an iron, pre-heat iron at maximum temperature for fabric. Place aluminum foil on ironing board and the painted side of the fabric down. Press against the backside for 15-25 seconds per square foot. Use in a Commercial Conveyor Type Oven: 350 degrees for 3 minutes and two passes if necessary. Fabric should be hot to the touch in order to set colors. Versatex Fixative Even easier (and softer! ); mix Inks with Versatex Fixative right before use for permanent results without heat setting! Customers who have tried it are very impressed! Note: Versatex Fixer can be used with the Versatex Printing Inks to increase wash fastness and to assist in the heat setting process. 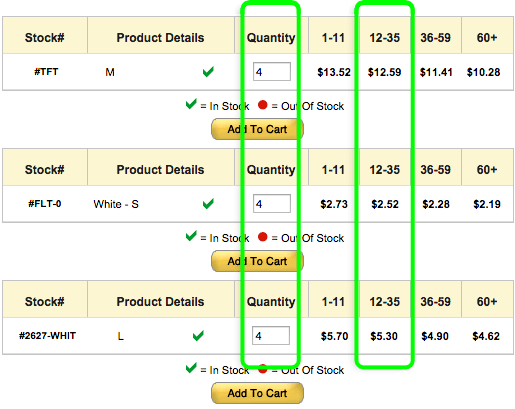 Add 1% to 3% by volume to Printing Ink. The pot life of the ink after addition of Fixer is 6 hours. After application allow ink to dry for 12 hours before heat setting at 225 - 300 degrees. Or let dry 4-6 days without heat setting before washing. Always do test runs before running productions. Starter Set #1 contains: Eight 2 oz. jars of yellow, violet, green, blue, bright red, brown, black, white. Eight 2 oz. jars of golden yellow, magenta, scarlet, orange, yellow-green, navy blue, sky blue, red. For lightening Versatex Printing Inks without thinning them. Paint worked great on T-Shirts. As always darker color paints on lighter color shirts always works best. Otherwise you need an undercoat of white. 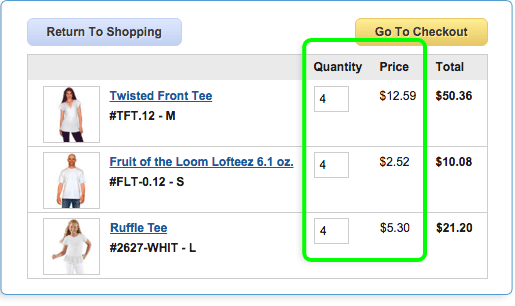 We found that you could do between 50 and 60 shirts per 8oz of paint for an average design. The metalic bronze worked well on a stonewashed blue with a single coat of paint. These are great paints for screen printing they pull very evenly across the screen but they a bit too transparent to print on dark fabrics without flashing with white first. I have been using versatex for 14 yrs now to do my tie dye. It comes out crisp and never runs or fades I just love it. Fast and simple. Thank you Dharma ! I used this with stencils on t-shirts and it went on beautifully -- the opacity was wonderful. Hoping to have equally excellent results in the future. great that is why we have used it forever.